Free range gammon, traditionally smoked and dry cured by hand for a full flavour. 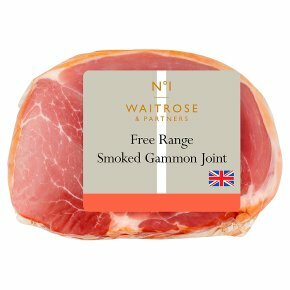 - Our free range pigs are reared outdoors throughout their lives on carefully selected British farms exclusively for Waitrose. Free range British pork from pigs sired by pedigree Hampshire boars. Free range British pork from pigs sired by pedigree Hampshire boars. The Hampshire sire line has been chosen for its renowned tenderness and superb flavour. Our free range pigs are reared outdoors throughout their lives on carefully selected British farms exclusively for Waitrose. We have been working with a small group of dedicated farmers for over 10 years; selecting them for their high standards of animal husbandry, welfare and a commitment to sustainable farming. Hob. Time: 30 mins per 500g + 30 mins. To boil. Remove all packaging. Place gammon in a large pan of water. Bring to the boil, reduce heat, cover and simmer. Cook thoroughly until the juices run clear. Leave to rest for 10 minutes before carving.